New South Wales racing cyclist Ken Ross had success in both road and track cycling in Australia and Europe. Ross was among a select few Australian cyclists competing in Europe after the First World War, and he was among the first English-speaking sportsmen to enter Germany after the end of the conflict. Ross was born on 11 August 1900 in Paterson, near Maitland in New South Wales. He was the youngest of six children — five boys and one girl. When Ross’s father died in 1914, his mother Rosina (Rose) decided to buy an apple orchard at Castle Hill on the outskirts of Parramatta in north-western Sydney. With two of his older brothers away at the First World War and the others married or working away from home, Ross was the only child to make the move with his mother to Castle Hill. They travelled there by horse and sulky, camping overnight along the way. After the move to Castle Hill, Ross became involved with local bicycle clubs and was soon competing at the highest level. He began winning events and in 1917 won the Parramatta Championship. In 1920, Ross entered the first Goulburn to Sydney race (a major event on the Australian racing calendar) staged after the First World War. Having defeated the American track pursuit champion Alf Grender in an earlier race, Ross received a five-minute handicap for the 128 mile (206 km) race. Although he recorded the fastest time, he finished in second place, just outside the course record. As well as continuing to compete in road racing, Ross had his first experience of six-day track racing in Sydney in 1919. Six-day racing, involving a single cyclist completing as many laps as possible around a banked track for sixteen hours a day over six days, began in England in 1878. The first six-day race in Australia was in 1881. In early races, contestants used high-wheeled bicycles and competed as individuals. In later events, safety bicycles became standard. In 1899, New York City and Chicago passed laws forbidding cyclists from racing for more than 12 hours a day. This led to promoters pairing riders into two-man teams, with at least one rider required to be on the track at all times. Willie Spencer and Ken Ross, Berlin 1922. Courtesy Jan Couchman. Although he favoured road racing, Ross moved to Europe when he was 20 years old with the intention of competing at the world track championship. At his first major European event, in Copenhagen, he was up against fellow Australian Bob Spears. As Australia's first World Sprint Champion, Spears was lauded as the fastest cyclist in the world. Although Ross did not make the final, he gained valuable experience. Ross competed in his first European six-day race in Brussels in October 1921. This event prepared him for the prestigious Berlin six-day race in February 1922 where he teamed with American sprint champion Willie Spencer. During the race, Spencer was only able to stay at the pace for three days which left Ross desperately looking for a replacement. Fortunately, a rider from another broken team became available. German rider Adolf Huschke joined Ross and, despite being penalised a lap for the team change, they fought their way back to fourth place. Despite a hectic schedule, Ross was determined to have a match race with world pursuit champion Oscar Egg while he was in Europe. It took a year to set up the match in Paris. Ross won the match and claimed the world crown for that event. While he was competing in Europe, Ross regularly sent postcards and photographs to his mother. I suppose you are getting over Christmas. Mine was very quiet, the worst Christmas I’ve ever had, but never mind we will make up for it when I get back to dear old Castle Hill. There is no place like home take it from me. Ross's mother Rose was a central figure in his life and his regular postcards home from Europe reveal the close bond between them and the deep affection and respect he had for her. I wrote you last night but I got a letter from you this afternoon so thought I would let you know I also forgot to tell you that I received that cable from you … I got it at 4 o’clock on 10th August. I was more pleased than if I had won a lottery. I cannot thank you enough by letter for sending it, but will not forget when I get back home. It put new life into me to think there was someone thinking of me. After a number of years in Europe, and having had success in all forms of road and track racing, including motor-paced events, Ross returned to Australia. Shortly after his return, in 1924, Ross married and moved to a citrus orchard near Gosford, New South Wales. He continued to compete in road and track events, at the same time as running his orchard. Ross won three Sydney six-day races in the 1920s — 1922 with George Hammond, 1926 with George Dempsey, and 1928 with Jack Fitzgerald. Ross recorded the fastest time in the 1926 Goulburn to Sydney road race, as well as gaining 2nd place. Also in 1926, he partnered George Dempsey to win the 1926 Sydney Six-Day race, won an important teams race with L Smith, and claimed the huge prize of one hundred pounds for the Melbourne handicap. During the 1927 season. Ross established a new record of 7 hours 2 minutes 5 seconds for the 128 mile (206 km) Bathurst to Sydney race. He also added another six-day race to his tally, this time partnering with the famous sprinter Jack Fitzgerald. The 1928 Goulburn to Sydney race appeared to attract far more interest than usual because it was the first time RW 'Fatty' Lamb was to ride as a professional after having won the event two years in a row as an amateur. Ross won the race with Lamb coming second. Ross not only achieved the fastest time on three occasions in this prestigious race, but had a first and two seconds to his credit. At a time when Victorian riders often dominated competitive cycling, Ross was one of only three New South Wales riders to achieve fastest times in the Goulburn to Sydney race throughout the 1920s and 1930s. Overall, he competed seven times. He achieved the fastest time on three occasions (1920, 1926, 1928), first place and fastest in 1928, second place on two occasions (1920, 1926), third fastest in 1930 and fourth fastest in 1931. 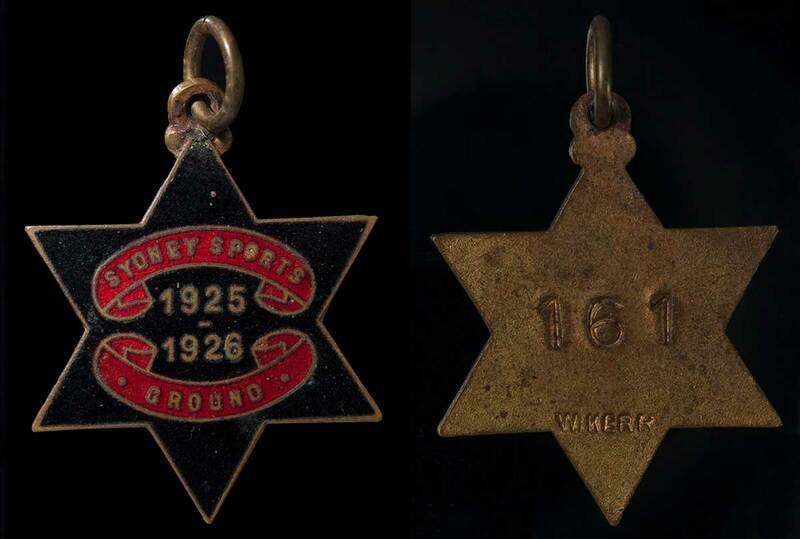 Text: front - DUNLOP / GOULBURN TO SYDNEY / ROAD RACE / 1930; back - K. ROSS. / PLACE 13th. / TIME 5-32-30 2/5 / L.N.S.W.W. After nearly 10 years of racing, Ross decided to devote more time to his family and his orchard business in Avoca, north of Sydney. However, he did continue to race. He contested the 1930 Goulburn to Sydney race, but a new generation of young riders was in the ascendancy and the fastest time was set by Hubert 'Oppy' Opperman. Strangely enough, this was the first and only Goulburn to Sydney race where these two prominent riders met. Ross competed again the following year and recorded the fastest time. In 1934, Ross was selected to captain the New South Wales team for the Victorian Centenary 1000. In preparation for the event Ross planned to ride from his Avoca home to Melbourne. At Gundagai, Ross was hurt in a collision with a car. A settlement was made with the driver and Ross was paid expenses and was able to claim the £5 appearance money which he lost by not being able to compete in this great event. After a 15-year career, Ross retired from competition shortly after the Gundagai accident. He continued to train other cyclists, with some success, including Torn Brown who won the 1932 professional Goulburn to Sydney race. Ross remained an active member of the Avoca Beach Life Saving Club and he was given much of the credit for training Trevor Gallard, who won the Australian surf ski championship in 1951. Ken Ross died at Gosford in March 1974.